Password-protected files might be a hurdle in the investigation process, as forensic investigators need to crack the passwords to gain access to the locked files. Password crackers use two primary methods to identify correct passwords: brute-force and dictionary searches. When a password cracker uses brute-force, it runs through combinations of characters within a predetermined length until it finds the combination accepted by the computer system. 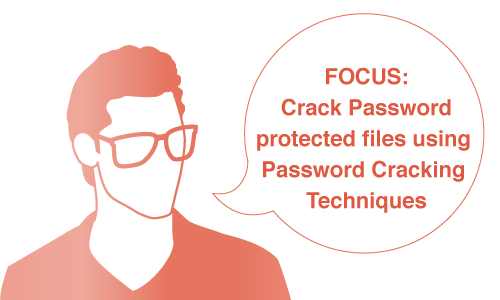 The objective of this lab is to provide expert knowledge in cracking password-protected files using password cracking techniques or password crackers that recover the passwords. Ronald Smith, an employee of Advanta Pvt. Ltd., is suspected by his manager of having hidden sensitive information and company records in password-protected files, which he can later sell illicitly to competitors. In order to investigate Ronald's system, the company has hired a forensic investigator, Matthew, an employee of a reputed forensic investigation firm. In dealing with such cases, to conduct a forensic investigation Matthew needs to implement various password cracking techniques or use password crackers to gain access to the potential evidence concealed in the password-protected files.